British TV keeps producing quality detective dramas even as American TV clings to the C.S.I. franchise and abandons the 10pm time slot to Jay Leno. 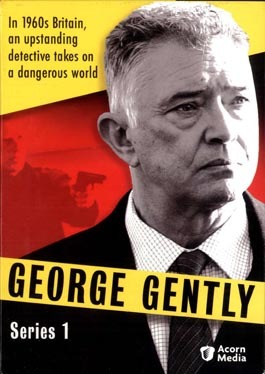 The BBC production George Gently, based on the novels of Alan Hunter, aired its pilot in 2007 and followed up with two self-contained episodes of about 90 minutes in 2008—they are now available as a set from Acorn Media (the show is set to continue next year). Veteran TV actor Martin Shaw (Judge John Deed, The Professionals) plays the title sleuth, whose tales unfold in the mid-1960s. He is a battered man, trying, and not succeeding all that well, to survive the hit-and-run death of his wife. Like a lot of detectives approaching retirement, he also clashes regularly with his officious superiors. On the verge of retirement, Gently heads instead to Northumbria looking for an old nemesis and finds himself caught up in some strange and vicious murders among a bunch of Teddy Boy motorcyclists. Cracking that case, he stays for two more: one involving an IRA bombing and the other a grudge that has been festering since the war. Shaw brings a lot of stolid dignity to the role, which he needs to counterbalance the overeager ministrations of his new assistant, young Detective Sergeant John Bacchus (an amusingly Uriah Heepish performance by Lee Ingleby). Full of himself, not above cutting corners and even a touch corrupt, Bacchus proves a trial to the no-nonsense Gently. The mysteries are well plotted without too many loose ends, and the period setting makes for some nice accents (like a vintage MG sports car that Bacchus drives) without being unobtrusive. The extras include text interviews with the lead actors and writer/producer Peter Flannery.